Almighty ever-living God, increase our faith, hope and charity, and make us love what you command, so that we may merit what you promise. Through our Lord Jesus Christ, your Son, who lives and reigns with you in the unity of the Holy Spirit, one God, for ever and ever. The feast of St. John of Capistrano, which is ordinarily celebrated today, is superseded by the Sunday liturgy. The first reading is taken from the book of Sirach 35:12-14, 16-18. The Lord is not deaf to the wail of the orphan, nor to the widow when she pours out her complaint. The one who serves God willingly is heard; his petition reaches the heavens. The second reading is from the second letter of Paul to Timothy 4:6-8, 16-18. In his three pastoral letters to Timothy and Titus, St. Paul often quotes his own life and sufferings to encourage his disciples and successors to persevere in their apostolic labors. He now feels that his earthly life is nearing its end but he has full confidence in God, his just judge, who will give him his eternal reward. The Gospel is from St. Luke 18:9-14. During His hidden life in Nazareth, and especially during His public life when He traveled through the towns and villages of Palestine, our Lord met sinners of all kinds. There is not a single record of a harsh word spoken by Him to any of them. In fact, He was accused of mixing too freely with them. His answer was that "it was those who were ill who needed a doctor, not those who were in good health." The sinners He met knew that they were ill. They regretted their sins. He forgave them. There was one group, however, and only one, against whom He uttered condemnation and for whom He foretold an unhappy ending. These were the Pharisees. In Mt. 23, the whole chapter is devoted to Christ's condemnation of them. It contains eight "woes" which He utters against them. He calls them by many unflattering names. One was "whited sepulchres, appearing beautiful to men on the outside but full of dead men's bones and all uncleanness within" (23: 27). Such harshness, coming from the gentle Christ, may surprise us, but knowing as He did that pride, the first and basic sin of mankind and the root of all other evil in the world, was so ingrained in their very hearts, that they could never seek forgiveness, He stated nothing but the truth concerning them or to them. In this parable which He addressed to the Pharisees themselves, He tells them once more where their pride will lead them. They will be excluded from the kingdom of God, because they will not admit or repent of their pride and their lack of charity. Instead of thanking God for the many gifts He had given them, they almost demanded thanks from God for being such pious people. They had virtues. They avoided serious injustices. They did not commit adultery. They fasted often. They paid all their Temple dues, but it was all done, not for the honor and glory of God, but for their own honor and glory. They told the world about it. They demanded the first places in the synagogues, and special marks of reverence on the streets. They had to be called "masters" as they claimed to represent and interpret Moses to the ordinary people. One thing that we can learn from this sad story of the Pharisees is that, while God approves of no sin, His mercy and His forgiveness is available for all sinners except the proud. It isn't that God cannot or will not forgive the sin of pride but that the proud man will not ask for God's forgiveness. We must all be on our guard against this insidious and destructive vice. It is insidious because it can grow in us almost without our knowing it, and once it has taken root it is difficult to eradicate. It is destructive because it spoils every other virtue we practice and every good work we do. Charity, or brotherly love, cannot flourish in a proud heart, for a proud heart is so full of self that it has no room for others. No true love of God can exist in a proud heart, for even the very acts of religion which a proud man performs, are done for the motive of self-glory and not for the glory of God. The Pharisee in this parable proves that fact. He boasted of his good works. A few simple straight questions can tell us whether or not we are proud. Do we like others to see and hear of our good works, or do we prefer to do them in secret? Do we give as generously to charitable causes when no list of benefactors is published? Do we willingly take part among the rank and file in parish activities or do we feel offended if we are not the leaders? Do we criticize offhand those who are not all they should be, or do we thank God that we were saved from similar temptations? Do we always try to find an excuse for the failings of others or have we excuses for our own faults only? God forbid that any one in this congregation should be suffering from this, the worst of all vices. If anyone recognizes that he is, let him pray to God from the bottom of his heart for the opposite virtue, the true Christian virtue of humility, and look for every possible occasion to practice it. Let us all remember the two men praying in the Temple. One was full of himself and boasted to God and to all present, of his many good works. 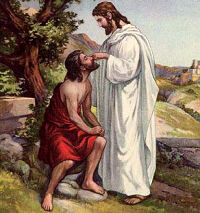 The Other just humbly beat his breast and asked for mercy-he had nothing to boast of. Yet, he left the Temple forgiven, the other returned home a worse sinner than when he had entered the Temple. — Excerpted from The Sunday Readings Cycle C, Fr. Kevin O' Sullivan, O.F.M. "When Jesus came to the ruler's house, and saw the flute players and the crowd making a din, He said, 'Begone, the girl is asleep, not dead.' And they laughed Him to scorn. But when the crowd had been put out, He went in and took her by the hand; and the girl arose" (Gospel). Notice the small flute-playing figures at the left. They represent the crowd of people who laugh their Creator to scorn. Yet how often we move among them, enjoying what we call "life," even though we may be spiritually dead. The trumpet-blowing angel at the right, summoning the dead to life, represents how Jesus, after the crowd has been put out by us, raises His Hand over us in absolution, extends His Hand to us in Holy Communion. St. Paul, too, warns us against these ;enemies of the cross of Christ whose end is ruin, whose god is the belly."